Emmy here today sharing two quick and darling cards I've created using one of the newest BoBunny collections Black Tie Affair. I'm also showcasing the We R Mini Alphabet Punch Board. I was inspired by the black and white elegance of Black Tie Affair to start. I wanted to add a bit of fun and some pops of COLOR to these cards for some added drama! I will give you a sneak peek in the photo below, but you'll really want to see the full tutorial video at the end of the post to watch the steps. To create my cards I used white card bases and different layers of pattern paper. After I inked their edges, I adhered all of the pattern paper panels with mounting tape to give extra dimension to my cards. Using the BoBunny Congratulations card die and a sheet of black pattern paper, I cut the fancy swirls which I placed between the layers of the card. 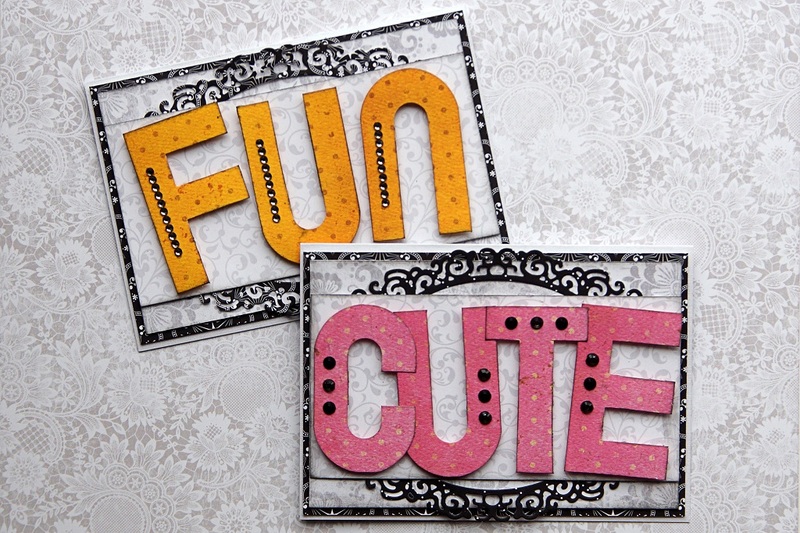 To create the letters I used We R Mini Alphabet Punch Board and BoBunny Double Dot Vintage cardstock. I inked the edges of the cut letters and added rhinestones to embellish them. Check out this quick video for step by steps! Thank you for stopping by today! Come back soon for more creative ideas from our design team! They are so SUPER CUTE!! The Alphabet Punch board is awesome!Love the Bo Bunny paper!